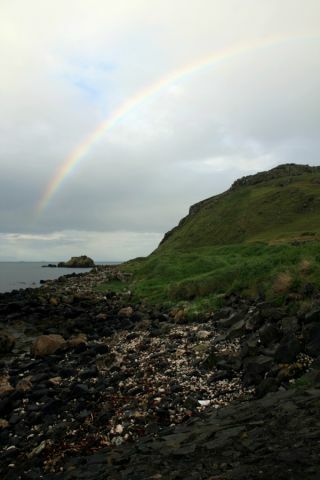 During a break in the mist, a rainbow drops over Northern Ireland's Antrim Coast, where scientists are searching for clues about what caused a mass extinction 200 million years ago. Mass extinctions are a relatively common theme in the history and evolution of life on Earth, and the most famous one is the extinction of the dinosaurs 65 million years ago. A plethora of research has been conducted to determine how the dinosaur era ended, generating theories of massive volcanic eruptions, catastrophic climate change and giant impactors from space. However, much less is known about another remarkable extinction event that occurred roughly 135 million years earlier — an extinction that may have set the stage for the age of dinosaurs . The mass extinction that occurred just before the boundary between the Triassic and Jurassic periods wiped out much of the life on land and in the oceans, leaving the world ripe for dinosaurs to plunder. For astrobiologists, the causes of this extinction comprise one of the greatest murder mysteries of all time. Now, a team of scientists is helping to reveal the secrets of the Triassic-Jurassic (T-J) extinction by studying geological formations around the world that bear evidence of a traumatic disruption in Earth's ecosystems some 200 million years ago. The team of researchers, led by Paul Olsen of Columbia University and Dennis Kent of Rutgers University, gather on a misty Irish morning in a small parking lot in Whitehead, Northern Ireland. Here, they are able to cross the train tracks that hug the coastline and scramble down to a seawall that provides a safe route along the rocky shore. As their shoes slip along the damp stone, the small cliffs come into view ahead. There is nothing particularly dramatic about the cliffs themselves, which are nestled below the train line and an imposing seawall topped with barbed wire. But the crumbling rocks peeking out from straw grass and brambles are a rare outcrop of material from the T-J boundary. They contain physical and fossil evidence that could help determine what happened to Earth's ecosystems before, during and after the T-J extinction. On a cool, misty morning, the research team makes their way along the top of a seawall toward the research site. At the time of the T-J extinction, the view from Northern Ireland's Antrim Coast may have been quite similar to the one that the research team is treated to today. In the late Triassic, Earth's landmass was smashed together as the single supercontinent Pangaea, and the British Isles were positioned relative to one another in much the same way they are now. However, the waterways of the North Atlantic that now separate Ireland and Great Britain had much less exchange with the open ocean. In fact, this body of water was more akin to a large, inland sea. As the waves of this sea rolled in and out, the sediments they gradually deposited on the floor recorded a history of the environment that can be read like a book by geologists today as they dig down through the layers. The late Triassic was a time of plenty for Earth, and the planet was a veritable paradise for life. Even the land now known as Antarctica was temperate, moist and supported a diverse range of flora and fauna. On the shores of the ancient Irish Sea, amphibians roamed the land alongside reptiles, some of which had some distinctly mammal-like traits. Many of the mammal-like reptiles were wiped out along with a vast array of single-celled and multicellular creatures on sea and land. Theories have been put forth about how this could have happened, but evidence of the true cause has eluded scientists for decades. Like taking books from a shelf, the team pulls out samples of the layered rock from the cliff face. Evidence of the T-J extinction has been reported by numerous researchers working in sites throughout the world. For instance, a sharp decline in organic carbon and marine organisms was reported in samples from Canada's Queen Charlotte Islands in 2001 and St. Audrie’s Bay in England in 2002. With their sampling efforts in the United Kingdom, Paul Olsen and his team are hoping to add their expertise to solving the T-J question. In various locations throughout the UK, scientists have identified outcrops of rock from the T-J boundary that are uniquely exposed at the Earth's surface. These sites are like natural libraries for geologists, where they can simply walk up and pick up samples that were "written" by the Earth at specific points in its history. The researchers chose two additional sites in the British Isles to examine. The first was in western England's Somerset County. Here, the sediments that settled on the bed of the tropical sea between Great Britain and Ireland are now visible as great sheets of rock below the cliffs of the Bristol Channel. In these cliffs are visible layers of limestone and shale that contain a myriad of fossils — lasting evidence of the T-J catastrophe. The team's second site was Lavernock beach near Barry Island, Wales. At these sites, there is a "dead zone" where few fossils can be found at the time of extinction. At all three sites (Northern Ireland, Somerset and Wales), the cliffs reveal a unique feature that makes the British Isles of particular interest in the story of the T-J event. Near the time of extinction, the layering has been contorted. In contrast to the surrounding sediments, the layers ripple and bend as if they were shaken and pushed out of place. Could it be a clue of some specific, violent event that befell the region? According to Paul Olsen, "The scale of the disruption is huge, and a huge cause seems likely." This type of deformation is not rare in the geological record. Local disturbances, such as earthquakes, often disrupt the layers of rock beneath the Earth. What is unique is that it occurs all around the United Kingdom. If this deformation was caused by an earthquake, it would have been a very large one indeed. "Not only is this disruption seen in the UK," Olsen said, "but it also appears to be present in at least Belgium and maybe as far away as Italy, according to the work of my UK and US colleagues." Interestingly, at the Lavernock beach site in Wales, the deformation rests just below the dead zone where few fossils are found. This raises questions about whether or not the deformation event is tied to the loss of life at the T-J boundary. Even through steady rain, the researchers use rock hammers to crack open samples removed from the cliff. Many of the typical explanations for mass extinctions have been put forth as potential culprits in the T-J event. These include dramatic climate change or the evolution of new and more competitive life forms. However, geological evidence from the British Isles provides little support for these theories. The organic-rich shale that is widespread in the UK is evidence of a period of anoxia (no oxygen) — but these rocks were laid down seemingly later than the actual extinction event. Evidence for disruption of the carbon cycle due to global warming is also present, but again it postdates the main extinction event. In the UK, the extinction appears to time more closely to geological evidence of sea-level fall and loss of shallow marine habitats. Questions concerning an impact event at the time of the T-J extinction have been raised before, but there is no known impact crater from this time period that is large enough to have caused so much damage. The surface of the Earth is an incredibly dynamic place. Processes such as weathering, erosion and shifting plate tectonics mean that physical features on Earth are constantly being born and then wiped away. Mountains grow and wither, rivers change course and ancient impact craters are washed away or covered by soil and forests. The only known impact that is thought to have occurred around the time of the T-J extinction, and in a location near the Britsh Isles, struck the Earth near the village of Rochechouart, France. Today, the Rochechouart crater is so heavily eroded that no surface features are visible at the Earth's surface. Disruptions in the rocks surrounding the impact were discovered in the early 19th century, but it wasn't until 1969 that the French geologist François Kraut proved an actual crater existed underground. The Rochechouart crater is relatively small, with an estimated diameter of only 13 miles (21 kilometers), although before erosion it may have been about twice that wide. Unfortunately for Paul Olsen and his team, it is unlikely that the Rochechouart impact was large enough to cause a mass extinction all on its own. By expanding their sampling efforts, the researchers hope to gain a larger view of the events surrounding the T-J extinction. Rochechouart may not be the primary culprit, but maybe it's just one piece in a series of catastrophes, from impacts to earthquakes and the eruption of a giant pulse of lava flows, that befell the Earth at this point in history. Back on the Antrim coast in Northern Ireland, the researchers are finishing their day of sampling. New pieces of the T-J puzzle have been pulled from the cliffs, catalogued and placed in sample bags. The supplies are packed away and the now sample-laden backpacks are slung over shoulders. As the team climbs atop the seawall to make the trek back home, the mists finally give way to brilliant sunshine. The samples collected from Northern Ireland will now make their way back to Columbia University, where they can be carefully studied in the laboratory. On Earth, the elements referred to as PGEs (such as iridium, platinum, palladium and osmium) were concentrated in the core shortly after our planet was formed, leaving the crust depleted in these metals. This means that there is a lower proportion of iridium at the Earth's surface relative to debris objects (like asteroids and comets) left over from the formation of the solar system. Asteroids and comets retain higher levels of PGEs and have distinct PGE signatures, generally with more iridium relative to platinum and palladium. Most lavas have very low levels of PGEs with crustal ratios of the elements (although there are some exceptions), and volcanic and magmatic processes occurring on the way to the surface can also result in distinct PGE signatures. Thus, generally only layers with both high levels of PGEs and high levels of iridium are candidates for an impact origin. Studying PGE concentrations and ratios has helped scientists recognize impact structures in the past, even millions of years after they were formed. A famous example is the iridium anomaly at the Cretaceous-Tertiary boundary, which has been shown to originate from the impact of a giant dinosaur-dooming asteroid or comet. "We have already found platinum group element evidence of an impact in eastern North America and Morocco," Olsen said, "and if we find it here in the UK, we will make a concerted effort to find more definitive evidence of an impact such as shocked quartz. But searching for that is very laborious, and we need to know which specific layer to focus on." The Antrim coast will help the team build on previous studies from far-flung locations. Each of these locations offers a new perspective on the disaster that befell life at the boundary of the Triassic and Jurassic periods. With every new sampling effort, Paul Olsen and his team are getting closer and closer to understanding this pivotal period in life's evolution on Earth.